How did William Blake achieve classic status? What aspects of his art and personality attracted and repelled critics? How was the story of his afterlife coloured by debates and developments in the British art world? Moving between visual and literary analysis, Visions of Blake: William Blake in the Art World 1830-1930 considers the ways in which different audiences and communities dealt with the issue of describing and evaluating Blake’s images and designs. It ranges widely from the writings of Gilchrist, the Rossetti brothers, Ruskin, Swinburne, Symons, Yeats, Joyce, Chesterton and Fry, through to works by Ford Madox Brown, G. F. Watts, Dante Gabriel Rossetti, Walter Crane, C. R. Ashbee, Aubrey Beardsley, E. J. Ellis and J. T. Nettleship. Each chapter of this groundbreaking study deals with its own topic, but between them they build up a multifaceted picture of how a wide range of Victorian and Edwardian commentators connected Blake’s interest in pictorial composition, visual attention and ideas of cultural authority with broader contemporary matters and concerns. 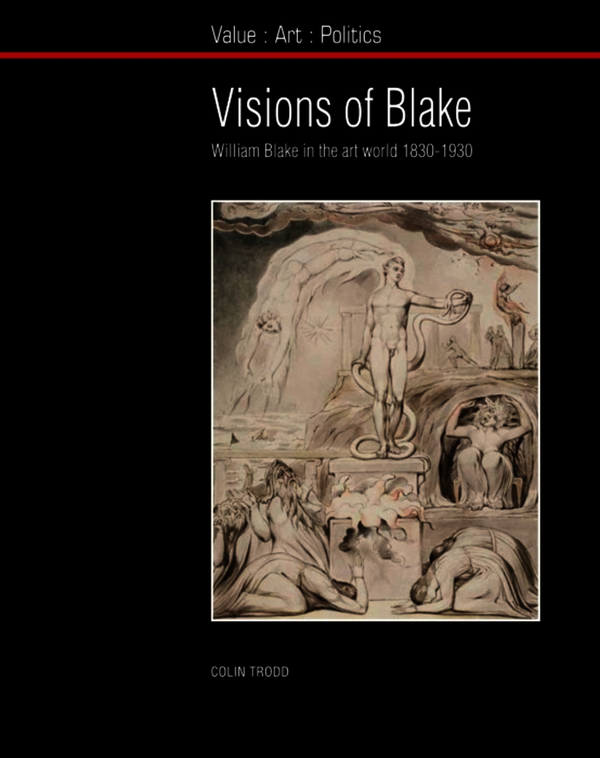 Visions of Blake is intended for all students and academics interested in Blake, Romanticism, Victorian culture, cultural politics and modern art. The first major consideration of Blake’s afterlife in art, art criticism and the art world in the period 1830-1930 Based entirely on original research. Offers a complete reevaluation of Blake’s position in British visual culture in the period. Challenges current assumptions that the nature of Blake’s afterlife was determined through examination of his poetry. Illustrates how Blake attained classic status by examining a variety of exhibitions, exhibition catalogues and the critical writings they generated in specialist and popular journals. Provides a series of fresh insights into the nature of Victorian and Edwardian art. Colin Trodd is Lecturer, School of Arts, Cultures and Histories, University of Manchester. Selected previous publications: Victorian Culture and the Idea of the Grotesque (Ashgate, 1999: joint editor) Art and the Academy in the Nineteenth Century (MUP, 2000: joint editor) Governing Cultures (Ashgate, 2001: joint editor) Representations of G.F. Watts (Ashgate, 2004: joint editor) Blake’s Shadow (Whitworth Art Gallery, 2008: main author) Professional accomplishments and any other biographical information which might be relevant to the promotion of the book: Curator of Blake’s Shadow, an exhibition of reactions to the work of Blake by Victorian and modern British artists (Whitworth Art Gallery, Jan–April 2008; National University, South Korea, Dec. 2008-April 2009). Published on Blake (Blake Modernity and Popular Culture, S. Clark and J. Whittaker eds., Palgrave, 2007) and delivered papers at Blake Conferences. Received an award from the AHRC to undertake research related to the book. Colin Trodd is Senior Lecturer in the School of Arts, Cultures and Histories, University of Manchester. He has co-edited Victorian Culture and the Idea of the Grotesque (Ashgate, 1999), Art and the Academy in the Nineteenth Century (Manchester University Press, 2000), Governing Cultures (Ashgate, 2001), and Representations of G. F. Watt (Ashgate, 2004), and is the author of Blake's Shadow (Whitworth Art Gallery, 2008).